There has been a major breakthrough reported in the detection of breast cancer, using landmine technology. 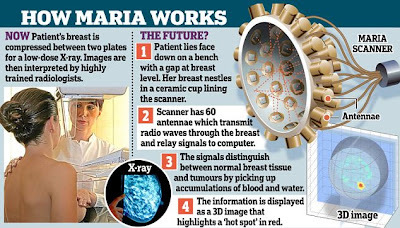 The new system called Maria - a pain-free radio wave scanner that is being dubbed as the most accurate and with least side effects as compared to mammography or x-rays presently in use. Using radio waves makes it easier to find problems in all tissue. The breast is held in a ceramic cup-shaped scanner while data are transferred to a computer within eight seconds to produce a 3D image. Read full story at Mail Online for more on Maria.